Time to re-taste an old classic from the Bruichladdich stable, this was the second Port Charlotte I ever had. Last time I tried it back in 2012, I was relatively new to single malt whisky and thanks to a few good reviews I bought a 10cl sample. Looking back, the PC8 has become somewhat of a cult classic. Some even call it the best Port Charlotte release. Nose: It has that dusty scent of an old grainery, like a malting floor with fermenting barley, with soft notes of linseed, iodine and peat smoke seeping through. Mouth: The same powerful attack that you would expect from an Octomore. Briny on the body with a rain of hot ash and soot on the palate. A touch of mint and ginger in the underlying layer. Finish: Takes some time to kick in, but is long and satisfying. Soft notes of liquorice and salty lemon, with some wood polish, and peat & tar in the tail. The verdict: It took me right back to the shores of Islay, to the smoking kilns of Laphroaig where I got a taste of the peat smoked barley. Overall this is not a complex whisky, but it paints the story of Islay in bold strokes. Throughout the distillation and maturation process little to no new flavours were added. The nose says it all: barley, smoke and peat, all this whisky needed to be splendid. Thumbs up. Thanks, I'm no expert here, thus far I've only had The Peat Project, PC7, PC8 and PC10 from Port Charlotte and the 5.1 and 6.1 from Octomore. The early PC's were much more powerful due to their young age and high percentage of ABV. So in a way it is only natural that they share similar profiles as the Octomores. The Octomore 6.1 was nothing like its younger brother the 5.1, my tasting notes from that one are pretty similar to what one would expect from a Port Charlotte. The 5.1 was a true epiphany, a straight punch in the nose, an iron fist in a velvet glove. After that the 6.1 was a true letdown, but I hear the new 6.3 is a worthy successor of the 5yo series. @rigmorole my scoring system: <75: undrinkable, avoid at all costs 75-79: acceptable, give it a try but don't spend to much money on it 80-84: average, enjoyable whiskies mostly easy sippable entry-level SM 85-89: above average drams, often well aged expressions, open your wallet 90-94: excellence in a bottle, buy alert on green, sorry kids no x-mas presents this year, daddy needs this bottle 95-99: divinity: call your bank manager for another mortgage on your house. One more thing I would like to add here: the bottle of PC8 here had probably been open for more than 6 months, thus it lost some of its peatiness. Two years ago I would probably have given this a 89 or 90. First vapor: Dates, ripe orange and peat like sneakers (or blown-out birthday candles). Nose: The principal aroma is baklava (walnut variety, with dark honey) with salty orange/lime and sweet gingery gunpowder. Maybe lightly floral: Deeper inhaling can bring amaretto, light lilac and pale chalk. Palate: Entrance is on fire, burning lighter fluid. (If you can even notice it, the flames are over floral cherry). Keeping it in the mouth creates a thick and syrupy maple, mixed warm butter and a heaping of hot ginger. After swallowing, that ginger gets really hot on the tongue-- hot as bacon fat-- while a touch of minty coolness relief develops inside your cheeks. Finish: Peppery ginger over lingering orange-honey sweetness (much lighter now)...; and decaying into ash. Nose-with-water: Water makes this marzipan, in a salty pastry, and with some rubber (or those sneakers again). If forced to pick out a fruit base, it is green apple; but it is not especially fruity. Palate-with-water: Water makes this tar on the entrance; then into honey & vanilla & smoky macadamia nuts; and then, as before, tingling with ginger on the tongue. Same finish. So I feel much better adding drops of water to this one, since it smothers that overbearing entrance to pleasant smoke, while also bringing out some vanilla; and the hot ginger is tamed to a nutty tone. The overall impression is then a rich combination of tar, salty nuts, & honey. Thanks @Wills, I recall your review and not fully believing that the entrance could have such a bite.... Obviously I underestimated. I vacillated between the low number that I mentioned for undilute and maybe a 92 for the freshest, unoxidized, mouthwatering pour cut with water. But I agree with you, 89 describes the overall impression. @rigmorole The bottle seems available on at least 4 webshops that I could see online, including MoM and WO. Not quite extinct! Go for it. At 60.5% ABV, this fine dram should pack a punch on the nose... or so you would think. A lesser distillery would present your olfactory machine with aromas which can bet be described as "sting-y" and "anesthetiz-y". Not Port Charlotte. This dram is so smooth on the nose that it makes 60.5% the new 50.5%. The palate of the PC8 is warm and cosy, but very complex. I get crisp green apple, BBQ'd chicken and embers of a long died-out camp fire with a strong background of smoke. But, this palate is a chameleon. It will change with each sip, which uniquely categorizes it as a fun whisky. The finish has the perfect amount of phenol - that keeps going into tomorrow. Conclusion: Young at heart, wise in spirit. Thanks for the review, Mark. I plan on grabbing a bottle of PC8 before they're all gone. I know people say 'What the hell is Bruichladdich doing? Churning out an expression a day?' But you know what? They make sure each expression is worth the trouble. And the PC8 certainly is! Obvious smoky peat on the nose, of course. Let's get that out of the way and try to find what's hidden amid the swirls. First some nuts. Then a nice piece of sausage on the barbecue grill. Accompanied by a glass of honey milk. Sprinkled with a nice pinch of rock salts. Quite glorious actually. Wish I could find it in Portland. Unobtainium. It is normal that certain whisky tastes a bit different under different circumstances - what's been on your palate before, what's your mood, what's outside temperature... But this whisky has such a strong personality that it neglects all factors and enters the scene erasing all previous experiences - here I am, enjoy me! Nose: more on the smoky and peaty side of course, but there are also quite some citrus and a bit of white fruits. Palate: initial warm and sweet glow, it explodes with baked fruits, pepper, spices, lime, ginger, and leaves cloud of smoke after explosion. Finish: magnificent, long, medicinal, sterile, road tar, coal, machine oil. It is actually so long that you can enjoy it even after brushing your teeth. I enjoyed it's younger brother An Turas Mor very much. And this one is so much more intense and mature! Great balance contributes to being extremely attractive whisky. Was able to find a bottle of this bad boy in Chevy Chase for $99.00, the normal retail where most stores will mark this up to $150-200. Pouring light golden to near white. Huge, thin and delicate legs. Nose is same deal as the PC7 and PC9- you have to really space out your nose from the snifter otherwise you are just going to get hot hot fusel alcohol, like lighter fluid. Space it out and at the right moment this one really is the superlative of the PC series that I've tried so far: maple bacon, chocolate sugar covered bacon, fat, honey, brown sugar, marzipan, amaretto. Taste is hot hot up front moving to rich maple, honey glaze, rendered bacon fat. Some macadamia nut fat, brown sugar, dessert profile. Delicious, world-class. Much more aggressive than it's Ardbeg counterparts, but I like this a bit more. Just more intense, more smokey and less "peaty". I'm a big fan. One of the best scotches I've ever had. This one is massive. At least for my palate and nose having little experience with peat monsters like this. But I really enjoyed it! I only got a sample which I tasted some days ago for the first time. I was hit in the face when the first drop hit my tongue. Today I tasted it the second time, now doing some recap. 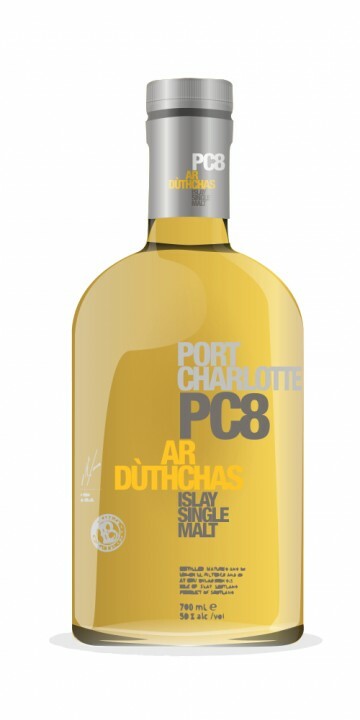 The PC8 Ar Dùthchas comes with 60.5% ABV and 40ppm. Peaty and medical flavors are dominating the nose. Sometimes it smells like sitting in the waiting room of your local doctor. There is Iodine and then some rubber. But also some fresh fruits. You could smell it for hours, even by adding some water it is so intense. The fruitiness gets bigger here. For a moment I have to think of cheese cake and vanilla. Firstly the palate is very salty and hot. It really explodes on my tongue! This dram is warming your mouth really wonderfully. Drinking it straight the alcoholic bite hits at some points but this one lets you salivate a lot and therefore it's not that rude. Of course it is much easier to drink by adding some (or even a good dash of) water. Besides the peat it gets a little sweeter and more smoky. The finish is really long with lots of peat and some wood in there, getting by maturing for 8 years. Overall this is a great experiment for me. You can discover really alot of flavors in this complex peat-monster. Additionally this dram can handle with adding some water which makes it really nice value for money. Finish: Sweet maltyness, big does of light wafting smoke, spirity. Wouldn't call this Peaty, very smoky, different from your islay peatbomb like ardbeg rather then peaty and earthy it is huge on light wafting smoke. This malt is young and it makes no big effort to hide it. It's untaimed, peppery with a huge measure of salt, liquorice, tang, peat and smoked bacon. But somewhere in all of that you can also fint a remarkable sweetness. The taste holds true to what is promised on the nose. And the aftertase provides a warm bonfire with even more salt and liquorice. I can't wait to see what the next release will be like! This Port Charlotte is 8 years old, as you would have guessed from the label. It was distilled on 18th July 2001 and bottled on 27th July 2009. No less than 30.000 bottles were filled at a whopping 60,5% ABV. I tried it H2H with the PC9. While peat is obviously present, your nose will first have to deal with a panoply of other aromas: olive oil, candlewax, walnuts, mud, flints. The fruit is hiding. Young apples and lime. With water, I get chalk and vanilla. Despite the very high ABV, it can be drunk neat. Hot, though. First you are clipped around the ears with ash and tar, but this is immediately followed by a wonderful sweetness in the form of vanilla, coconut and mint. Very spicy with ginger and white pepper. Water blots out a thing or two, but it remains sweet. The finish is long on ginger and peat. The nose was good, but on the palate, this is a winner.